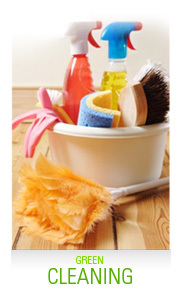 Below are my recommendations for safe and effective, green cleaning products for your home. I use these nontoxic cleaning products on a weekly basis – some even daily. I am extremely happy with how effective these products are. Plus, I have piece of mind that what's under my kitchen sink is safe for both my family and our planet. This ready-to-use nontoxic glass cleaner is designed for thorough cleaning and minimal streaking, without ammonia or alcohol. Glass & Window Cleaner is an upgraded formula made with vinegar and geranium extract for natural cleaning power. Glass & Window Cleaner cuts through grease and dirt, neutralizes sun-baked hard-water spots, lifts soils, and wipes clean from glass surfaces without excessive rubbing. It also reduces hazy buildup and visible streaking on smooth surfaces. This effective cleaning product even reduces dust deposits to provide a longer-lasting clean. Break out the big green cleaning power with this industrial-strength cleanser designed for your most demanding chores. This product is powerful enough to clean surfaces and destroy odors with ease, yet is gentle and safe enough to be used on children's toys or pacifiers.